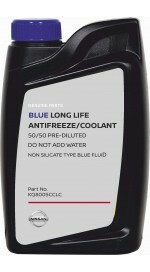 Nissan blue long life 50/50 Pre-Diluted Antifreeze/Coolant is an advanced formula ethylene glycol based product which use state of the art technology. Nissan Blue Long Life 50/50 Pre-diluted Antifreeze/Coolant contains no amines, no silicates, which may harm water pump seals, or borates that may cause aluminium corrosion and pitting. Nissan Blue Long Life 50/50 Pre-diluted Antifreeze/coolant provides long lasting protection for aluminium, cast iron and all other engine components. Refer to the vehicle’s owner or service manual for specific cooling system service procedures. Flush and fill the Vehicle’s cooling system in accordance with the specific procedures provided in the vehicle’s owner or service manual. Avoid contact with eyes and prolonged or repeated contact with skin. Wear safety googles or glasses, resistant gloves, and other appropriated protective equipment essential for your operation. Do not transfer to unlabelled container. Minimize exposure through good hygienic practices. Use or store only with adequate ventilation. Before use, review Material Safety Data Sheet for more detailed information, including chronic Health Effects. For Industrial use only. Genuine Nissan Heavy Duty Brake Fluid is a non- mineral oil-type fluid for use in Automotive Hydraulic Brake systems. Specially design for Nissan, this high quality performance Super Heavy Duty Brake Fluid is designed of use in ALL Nissan Vehicle Brake Systems. Check your vehicle’s operator’s manual for manufacturer’s service recommendations. Store brake fluid only in its original container. Keep container clean and tightly closed to prevent absorption of moisture. Do not refill container and do not use for other liquids. Avoid contact with eyes and prolonged or repeated contact with skin. Wear safety goggles or glasses, resistant gloves, and other appropriate protective equipment essential for your operation. Do not transfer to unlabelled container. Minimize exposure through good hygienic practices. Use or store only with adequate ventilation. Before Use, review material safety Data sheet of more detailed information, including chronic health effects. For Industrial use only. Don’t pollute. Dispose of used or unused product according to relevant Indian/state laws.